This heavenly bread is filled with a chopped apple and cinnamon sugar mixture, baked in layers. The top is sprinkled with brown sugar that becomes caramelized in the oven for added crunch, and the apples keep the bread moist and sweet. Apple and cinnamon go together perfectly, and the finishing touch for this bread is a simple glaze, but you can adapt this recipe to suit your own preferences (see notes). Preheat oven to 350F/160C fan/gas mark 4, and grease a 9×5 loaf pan or large bundt tin. Using a stand mixer, cream the butter and sugar together until light and fluffy, about 1 minute on medium speed before adding the vanilla, milk and eggs in one at a time. Add in the flour and baking soda and mix until just combined. 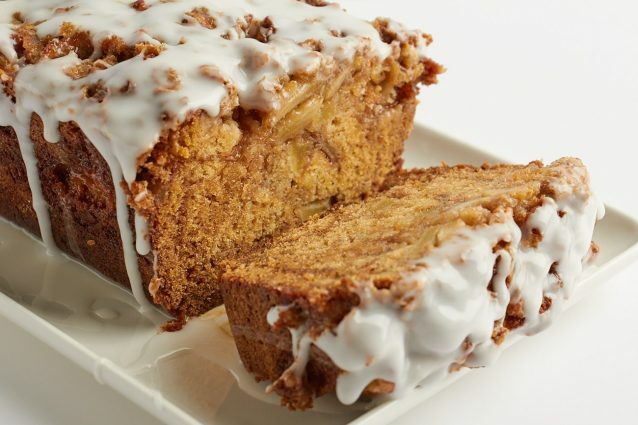 Combine your chopped apples with cinnamon and half the brown sugar in a small bowl then pour half the batter into the loaf pan, add in half the apples evenly over the batter. Repeat with the remaining batter and apples to form layers in the pan. Top with the remaining brown sugar and bake for 55-60 minutes. Once cooled, remove from the loaf pan and whisk together the powdered sugar and water. Drizzle the mixture over the loaf. You can make this in a loaf pan or a bundt pan, depending on your preference. Add nuts to the batter if you like, and on top of the bread to add some extra crunchy texture. Pecans and walnuts go well with this bread. Replace the 1/2 cup milk with buttermilk for a softer textured bread. Cook this recipe in a muffin tin to make apple fritter muffins instead of a loaf. If you’re doing this, reduce the cooking time to 20-25 minutes.